There are few things that feel as satisfying to me as a good organizational project. For a few weeks now our finished basement has been command central for operation “get the girl ready for college.” The floor next to the now empty storage unit that once held Barbies, Polly Pockets, and later, sheet music and notebooks and binders from each passing school year is lined with a succession of plastic tubs, each bearing the essentials of college life. 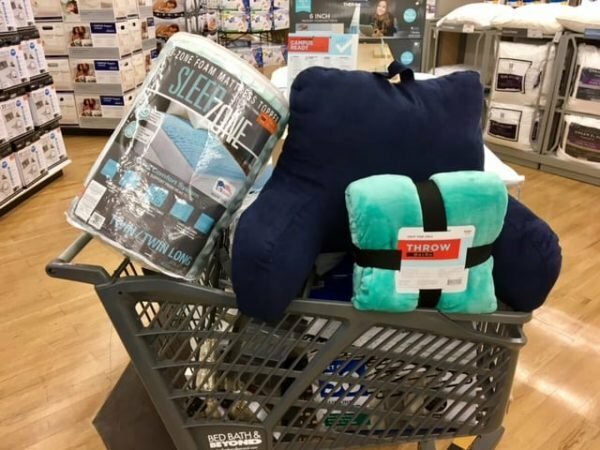 A shopping cart filled with dorm supplies is about so much more than twin XL sheets. What Should Be on a Dorm Shopping List? ; and the final, a Laundry Basket, itself is home to nests of hangers and 3M hooks. Amazon Prime Day recently added a hair dryer to the mix, and as I deposited this newest addition to the stash, I surveyed the contents with satisfaction. “We’re really making progress on that list!” I thought to myself, carefully avoiding the fact that the ultimate end to this progress will mean her leaving.
? It’s overwhelming, it’s silly, it’s monumental, it’s exciting…and it’s taking everything I have not to cry every time we darken Target’s door. Recently I decided that since dorm fridges now come with a built –in microwave on top (KIDS TODAY! ), that it stood to reason the girl would need at the least a bowl, a mug, a plate and some utensils for late night dorm munchies. Friends, the search for the perfect affordable and microwave-safe dish set has turned me into Indiana Jones looking for the Ark of the Covenant. On a recent excursion the girl turned to me and asked, partly laughing, partly mocking (the Force runs deep with this one, what can I say) “why are you so OBSESSED with this plate/bowl/mug thing?” I couldn’t answer, not there in the middle of Walmart, that it was because this felt like one of the only ways I can still actively mother her. All the other college preparations, the course selection, the PLUS loans (sigh), the health forms, are bureaucratic and removed. But the care and feeding of the girl – that’s my turf —and it’s fast slipping from my fingers. Recently, a longtime friend on an online mom’s group good-naturedly ribbed me about my “Great Big Dorm Shopping List.” Cool in her “slacker mom of a teenage boy” identity, she poked fun at things like stain stick and antibacterial wipes that nest securely in their bins waiting for move-in-day. And I get it. Some of us deal with this looming separation by hyper focusing on the list and some of us deal with it by distancing themselves from it. But neither approach covers the fact that these birds are flying their respective nests very, very soon. I won’t be there when she gets her first bad grade, has her first spat with a friend or roommate, experiences her first off-campus party, or has to go to the infirmary the first time. I won’t be there as she starts her campus job or auditions for her first college show, or pulls her first all-nighter. I won’t be there when she navigates her first campus romance, sits outside a professor’s door during office hours or makes her first 2am Denny’s run. Nor should I be. This path with all its highs and lows is hers alone to journey. So I focus on what I can do, and sit with her over the Bed Bath and Beyond catalog to find the perfect comforter, remind her she’ll need a rack to dry all those cotton dresses that tall girls never throw in the dryer, and agree that yes that desk lamp is perfect. And when she’s not looking I add some Advil to the bins… after all that first hangover is out there too. It’s easy to make fun of us college freshman moms. We get it, we can be a bit much. We know they’re not leaving for good, yes we know they “all come back.” We know the four years will fly by. But we also know this is the beginning of the big separation, we’re not just saying goodbye to our kids, we’re saying good-bye to the hands-on role we play. Saying goodbye to a pretty significant part of ourselves. So give us a break and, instead of asking if we’re excited to be empty nesters, ask us what we’ve crossed off the list lately. We’d love to tell you about that sale on hangers we just found. Please note: We receive small amounts of compensation through some of the links in this post.